9-year-old Shenne Aksha-ool from Tuva feels a little better after a course of X-ray-therapy, says Bailak, Shenne's mother. She expresses her big gratitude to all those who sent their help to the family. The most substantial help came from Juergen and Elike Boden family (Germany) who recently published the greatest book by Sevian Veinshtein 'Geheimnisvolles Tuwa', 455 dollars were collected by khoomey fans with Steve Sklar's help. Alexei Kyrgys from Kyzyl school 14 has won in the Computer Genius Competition held in Novosibirsk. He was recognised the best in the web-design and was given a digital photo-camera as a prize. Over 3000 schoolchildren from the Siberian regions took part in this competition, but only 19 were selected for the final. Young journalists of Tuva gathered today in the conference-hall of the Kyzyl Educational Centre 'Anyak' (Youth). Over 20 senior schoolchildren in Kyzyl chose journalism as their future proffession and study it with the help of tutors - Anna Lachugina, Lubliana Paratmaa, Tamara Kuular in 'Anyak'. Almost 10 students of the Republican Lyceum are members of the editorial staff of the Lyceum news-papers issued quarterly have joined them today. He was not a singer, not a famous khoomeizhi, not an artist, but he was known by everyone in Pii-Khem district. He was a cultural organiser, whose energy made every concert a worthseeing event. Mark Oyun, 73, died today. He was the only one whose name was given to the Palace of Culture in his home Turan, alexistrative centre of the Pii-Khem district, not after his death, but in his life time, as a sign of big respect from his countrymen. Maadyr Mongush, well-known Tuvan wrestler, was honoured to lay the first symbolic stone to the construction of a new sports complex which will be erected in the Southern neighbourhood of Kyzyl. The official ceremony devoted to this event gathered over 600 'Yedinaya Rossia' (United Russia) party members, sportsmen, officials. Seminar 'Law and Media', carried out by Tuva-Online news agency in Tuva, was held today in Chadan for journalists of Western districts of Tuva. The third oldest Tuvan news-paper 'Chaa Oruk' (New Way) hosted colleagues and organisers. 63-year old 'Chaa Oruk' is the only well-off district news-paper in Tuva. In comparison to other district editions for which evry new issue is a problem, it is stably supported by Dzun-Khem district alexistration which is interested in making its local legislature published and thus valid. President Vladimir Putin opened a meeting with governors of the Siberian Federal District on Wednesday. This is not the first meeting he is chairing in Tomsk. He held a conference on the reform of the housing and communal economy here in 2001. 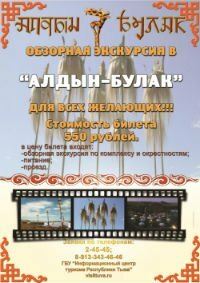 In Erzin, one of the most Southern districts of Tuva, a series of seminars for local journalists, carried out by Tuva-Online news agency, has started. It gathered correspondents of local news-papers, young journalists, district officials. Balance of freedom of word and journalists' responsibility, comments of laws regulating media, problems of small local news-papers, their financial dependence were raised by Marina Chanzan (Media Union), Dina Oyun (Tuva-Online), Dolaana Salchak (Autoradio), Augusta Perelyaeva (Human Rights Defence Movement), Lidia Irgit (Tuvan State Radio and TV Company). Tuvan deputies of the Legislative Chamber of the Tuvan Bicameral Parliament voted for the 5-year moratotium on gambling in Tuva. If the new legislature be supported by the Representative Chamber of the Khural and signed by the Tuvan Prime-Minister, it will come into force on the 1st January of 2007. Representative of the Government Ludmila Salchak, minister for trade and services, remarked that the executive power does not suport this initiative as it contradicts principles of the free undertaking. New head of the Tuvan Militia Viktor Lesnyak, 55, ex-chief of the Chelyabinsk miltia, came to Tuva in a company of the vice-minister of the interior affairs of Russia Nikolai Ovchinnikov, who presented a new appointee to the Prime-minister of the republic. New Tuvan militia chief after the first acquaintance with the work of the ministry, paid attention of his new subordinates to the unclean working studies, dirty walls and decayed banners of Russia and Tuva fluttering on the ministry's roof.